These Terms and Conditions of Use (the "Terms and Conditions") for Black Meetings and Tourism (the "Website") are between a user of the Website ("User") and Black Meetings and Tourism ("Black Meetings and Tourism"). Access to the Website or use of the Website content constitutes User's agreement with these terms and Conditions. User acknowledges that User has read these Terms and Conditions and that User accepts the terms thereof. USER AGREES TO READ THESE TERMS AND CONDITIONS OF USE CAREFULLY BEFORE USING THE WEBSITE. Black Meetings and Tourism reserves the right, at its sole discretion, to change, modify, add or remove any portion of these Terms and Conditions, in whole or in part, at any time. Notification of changes in these Terms and Conditions will be posted on the Website, and User's continued use of the Website affirmatively indicates User's acknowledgment of such changes and User's agreement to be bound by the Terms and Conditions as modified. Unless otherwise agreed in writing, User's right to use the Website is not transferable and is subject to any restrictions established by Black Meetings and Tourism. Black Meetings and Tourism may change, suspend, or discontinue any aspect of the Website at any time, at its sole discretion, without prior notice and without liability to User or any third party for such change, suspension, or discontinuance. 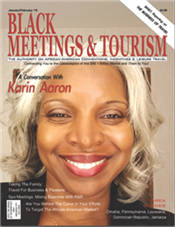 Black Meetings and Tourism may also impose limits on certain features and services or restrict User's access to parts or all of the Website without notice or liability. SHOULD USER OBJECT TO ANY OF THESE TERMS AND CONDITIONS OR ANY SUBSEQUENT CHANGE OR MODIFICATION TO THESE TERMS AND CONDITIONS, OR SHOULD USER BECOME DISSATISFIED WITH THE WEBSITE IN ANY WAY, USER'S ONLY RECOURSE IS TO IMMEDIATELY DISCONTINUE USE OF THE WEBSITE. SO LONG AS USER CONTINUES TO USE THE WEBSITE, Black Meetings and Tourism WILL CONTINUE TO RELY ON USER'S FULL AND UNQUALIFIED ACCEPTANCE AND COMPLIANCE WITH THESE TERMS AND CONDITIONS. User shall not have the right to sell, license, market, or lease the Website content to any party whatsoever without the prior written consent of Black Meetings and Tourism. User shall not have the right to distribute the Website content in any manner to any third party or unauthorized user. User hereby acknowledges that, as between Black Meetings and Tourism and User or any party acting through User, all title to and ownership of the Website and its content remains vested in Black Meetings and Tourism and nothing in these Terms and Conditions serves to transfer such ownership or title to User or any party acting through User. All copies and representations of content from the Website, including merged or modified portions, shall as between User and Black Meetings and Tourism remain Black Meetings and Tourism's exclusive property, shall continue to be subject to these Terms and Conditions, and shall contain all Black Meetings and Tourism copyright and other proprietary notices. User agrees to report promptly to Black Meetings and Tourism any observed violation of the above. User agrees that the Website shall not be used in any manner or for any purpose other than the permitted purposes as expressly described in these Terms and Conditions. User may not share User's means of access with others. User acknowledges that User is responsible for all usage or activity on User's Website account, including such use of the account by any third party. Any fraudulent, abusive, or otherwise illegal activity may be grounds for termination of User's account, at Black Meetings and Tourism's sole discretion, and User may be referred to appropriate law enforcement agencies. User agrees to indemnify, defend, and hold Black Meetings and Tourism harmless against liability for any and all use of User's account. The contents of the Website are intended for the benefit of User's legitimate non-commercial business. All materials displayed on the Website (including, but not limited to articles, reports, photographs, images, illustrations, audio clips and video clips, each also known as the "Content") are protected by copyright, and owned or controlled by Black Meetings and Tourism or the party credited as the provider of the Content, software, or other materials. Users shall abide by all copyright notices, information, or restrictions contained in any Content accessed through the Website. User acknowledges that he/she has no claim of ownership or other right to any Content by reason of its access, use, or otherwise. The Website is protected by copyright as a collective work and/or compilation, pursuant to U.S. copyright laws, international conventions, and other copyright laws. Copying or storing of any Content for other than User's legitimate non-commercial business end-use is expressly prohibited without the prior written permission of Black Meetings and Tourism or the copyright holder identified in the individual Content's copyright notice. IN NO EVENT SHALL USER ALTER OR DELETE ANY AUTHOR ATTRIBUTION OR COPYRIGHT NOTICE. Except as specifically provided in these Terms and Conditions, User may not modify, publish, transmit, participate in the transfer or sale of, reproduce, create derivative works from, distribute, display, or in any way exploit, any of the Content, software, materials, or the Website in whole or in part. No use is permitted which benefits any party other than Black Meetings and Tourism or User. Black Meetings and Tourism and other Black Meetings and Tourism products referenced in Black Meetings and Tourism.com are either trademarks or registered trademarks of Black Meetings and Tourism. Other featured logos, product and company names are or may be service/trademarks of their respective owners. Neither Black Meetings and Tourism nor Black Meetings and Tourismcom represents or endorses the accuracy or reliability of any advice, opinion, statement, or other information displayed, downloaded, uploaded, or distributed through the Website by any user, information provider, or any other person or entity. User acknowledges that any reliance upon any such opinion, advice, statement, or information shall be at User's sole risk. Black Meetings and Tourism reserves the right but not the obligation, in its sole discretion, to correct any errors or omissions in any portion of the Website. THE WEBSITE IS DISTRIBUTED ON AN "AS IS" AND "AS AVAILABLE" BASIS WITHOUT WARRANTIES OF ANY KIND WHATSOEVER, WHETHER EXPRESS OR IMPLIED, INCLUDING WITHOUT LIMITATION WARRANTIES OF TITLE, NON-INFRINGEMENT, OR MERCHANTABILITY, OR FITNESS FOR A PARTICULAR PURPOSE, OR THAT THE WEBSITE OR ANY MATERIALS OBTAINED THROUGH THE WEBSITE ARE VIRUS-FREE OR ERROR-FREE. NEITHER Black Meetings and Tourism NOR ANYONE ELSE INVOLVED IN CREATING, PRODUCING, OR DELIVERING THE WEBSITE CONTENT SHALL BE LIABLE UNDER ANY THEORY OF LAW (INCLUDING NEGLIGENCE) FOR ANY LOSS OR DAMAGE THAT MAY ARISE IN CONNECTION WITH THE FURNISHING, PERFORMANCE, USER's INABILITY TO USE, OR USER's USE OF THE WEBSITE, INCLUDING ANY DIRECT, INDIRECT, INCIDENTAL, SPECIAL, ECONOMIC, LOST PROFIT, OR CONSEQUENTIAL DAMAGES, OR OTHER KIND OF LOSS OR DAMAGE WHATSOEVER, EVEN IF Black Meetings and Tourism HAS BEEN ADVISED OF THE POSSIBILITY OF SUCH DAMAGE. IN NO EVENT SHALL USER BE ENTITLED UNDER ANY THEORY OF LAW (INCLUDING NEGLIGENCE) TO ANY MONETARY DAMAGES IN EXCESS OF ANY FEE PAID BY USER FOR USE OF THE WEBSITE DURING THE 12-MONTH PERIOD PRECEDING THE EVENT GIVING RISE TO THE CLAIM FOR DAMAGES. USER's RIGHT TO MONETARY DAMAGES IN SUCH AMOUNT SHALL BE IN LIEU OF ALL OTHER REMEDIES THAT USER MAY HAVE OTHERWISE HAD AGAINST Black Meetings and Tourism. USER EXPRESSLY ACKNOWLEDGES THAT USE OF THE WEBSITE IS AT USER's SOLE RISK. The Website contains links to other related Internet sites, resources, and sponsors of the Website. Black Meetings and Tourism is not responsible in any way for the availability of these outside resources or their contents. User should direct any concerns regarding any external link to that link's site administrator or webmaster. Black Meetings and Tourism is not responsible for the contents of any linked site or any link contained in a linked site. Black Meetings and Tourism is providing these links only as a convenience, and the inclusion of any link does not imply endorsement by Black Meetings and Tourism of the linked site or its contents. These Terms and Conditions shall be construed and enforced in accordance with California law. Any action to enforce these Terms and Conditions shall be brought in the federal or state courts located in Winnetka, California. Any rights not expressly granted to User in these Terms and Conditions are reserved to Black Meetings and Tourism. Any failure by Black Meetings and Tourism to enforce any provision of these Terms and Conditions shall not be construed as a continuing waiver of any rights under such provision. These Terms and Conditions represent the entire agreement between Black Meetings and Tourism and User concerning User's use of the Website and supersede any prior understanding or agreement whether oral or written.